A couple weeks ago I trekked to Wisdom House Retreat Center in Litchfield, CT to join in a weekend symposium for the newly formed Sound and Music Alliance (SAMA). This was a weekend like no other as I spent it with 100 of the most influential forces engaged in the intentional use of sound and music. SAMA is a technically a non-profit membership organization, but I feel it is best described as a community in the most real sense. People who care about a common cause, and are willing to invest themselves into the betterment of the community as a whole before their own self interests. I had the opportunity to reunite with old friends, current colleagues, leaders who I have always wanted to meet, and bright young stars who will help us propel the awareness of the transformative power of music and sound for coming generations. 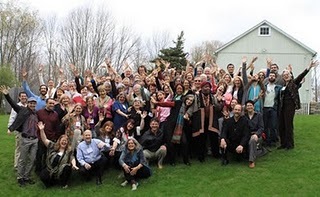 Physicians, pediatric therapists, music therapists, listening therapists, psychotherapists, musicians, product developers, and a host of other specialists shared their vision, ideas, and creative wisdom to envision the future of this diverse field. What is the vision? From my seat in this very wide circle of influence it is clear… the unequivocal acceptance and understanding that the right sound and music can profoundly change your life. That incorporating sound health practices into your daily diet can help you to achieve wellness, happiness, and a longer, more fulfilled life. There is much more to say, but for now I will share I am truly inspired by that weekend, and as I write listening to a Haydn String Quartet performed by the Arcangelos Chamber Ensemble and recorded by my dear departed friend and former Music Director for Advanced Brain Technologies Richard Lawrence that I compel you to take note of the sound in your life and see its potential to change it for the better. Please visit SAMA online and consider supporting the work of this fine organization by becoming a member.